Samudri Taapu Trek from Chandrataal There are two routes to reach Samudri Taau from Chandrataal Lake. One involves trekking along a long circuitous route which passes through origin of one of the streams which becomes Chandra river downstream. Trekkers have to walk over and places climb over numerous ridges spread over a number of mountains. For other trekking route, you have to climb down to the river bed and cross it river via rop eway. Camping near Chandrataal Lake, Himachal Pradesh Chandra Taal meaning Moon lake is a crystal clear lake residing between the glorious Himalayan mountains of Lahaul Spiti. There are designated camping areas near the lake. Hamta Pass to Chandra Taal Lake Trek in 7 days. 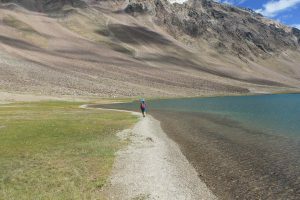 This trekking route will take you through wide varieties of terrain as we pass from Hampta Pass in Kullu valley to Chandra Taal Lake in Spiti. The trekkers cross different terrain like green pine forests, glaciers, deep valleys, open meadows and high altitude deserts. This trek should be attempted by people already familiar with at least basic trekking. Shimla Spiti Manali Holiday Tour Package A vacation through Shimla, Spiti and Manali is one of the best ways to rejuvenate the mind, body and soul tired by noise and pollution of the cities. This tour package eases you in to lap of nature through picturesque town of Shimla in to wilderness of Spiti and back to city life through relaxing ambiance of Manali. This tour will help you enjoy the rugged natural beauty of Spiti as well as the old world charms of Shimla and Manali in the easiest possible way. Spiritual Journey in Lahaul Spiti Come to one of the most sought after spiritual destinations available, Lahaul- Spiti in the Himachal Pradesh. Famous for its journeys of meditation and self discovery, this region is full of monks and sages coming here since thousands of years ago, from all over, especially from Tibet. Known for its scenic beauty, here are lots of monasteries and age-old sites and caves for meditation. Lahaul Spiti, Chandratal, Manali Holiday Package 13 days This holiday package starting from Shimla, covers most of Lahaul Spiti valley before ending in Manali. It’s a good tour plan for a small group of friends, families and young couples who want a holiday with fun, adventure and breathtaking sights. It has quite a bit of thrill and adventure without being too tiring.